I've been monitoring the conversation about the Super Hornet's absolutely mindblowing performance and gotten an inkling of the planes future ability to track targets (perhaps including stealth) at long range without use of its AESA radar (this also shows us why the RAF MIGHT BE PUSHING for more Tornadoes instead of F-35s). Which lead me to this realization. Even if the F-35 program progresses on track from this moment out, the F-35C will be produced in the lowest numbers and be the most expensive variant. 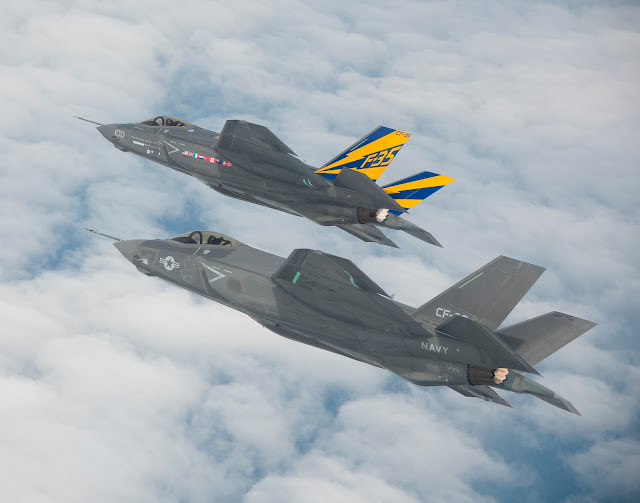 To take this line of thinking further an Aussie reader named Jason had the thought that the Navy might simply abandon the F-35 on cost grounds and seek to push ahead with only the Super Hornet as a money saving move. Super Hornet will complement the F-35. I think that report I've been barking for, the one ordered by the SecDef comparing the Super Hornet to the F-35 brought some painful facts to the table. I think the Navy has never been a fan of the F-35. I think Boeing is carrying the Pentagon's water and making a case to the public for why the Super Hornet is good enough. Remember there is a segment of the population that wants gold plated whatever for the military despite the cost and will agitate if the uber plane isn't in Navy Grey. This is a public relations campaign to sell the Super Hornet as the sole fighter for the Navy to its members and the general public. The F-35C is dead. One down, two to go with the understanding that these planes are Dracula on steroids so the best we can hope for is a truncated buy. Have you noticed that all the talk has disappeared from earlier? We heard talk of revising the B-1R, turning the F-15 into a missile truck, making the F-16 a missileer and other idea to tout missiles while the stealth fighters searched for targets. That talk has gone away. Why? Because they're trying to push the F-35 across the finish line and while those ideas will be revised later they will only serve to slice numbers now.